The first tip is a feature that is new to Windows 10. 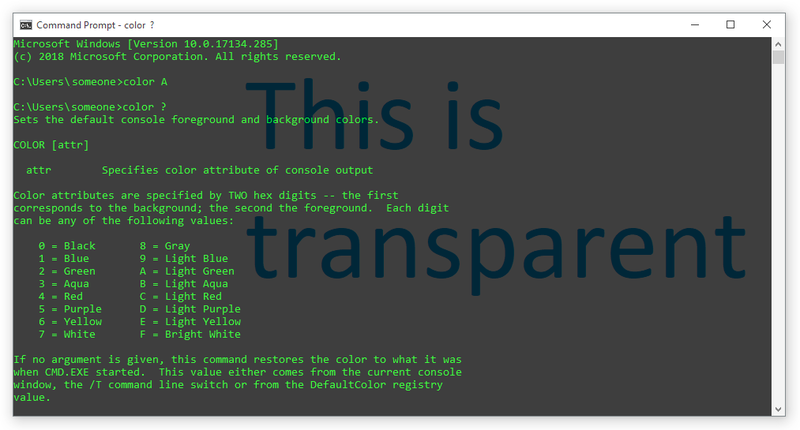 When you right-click on command prompt title bar and go to properties, in colors tab is opacity option. There you can adjust some transparency settings to get an interesting touch to the good old command line. As you see, there are other visual properties for colors, fonts, etc. If you want to get more fonts that are available in CMD properties by default, then check this out. Second tip – color command. Type “color ?” in CMD line to see more information what is available. For example “color A” to get some light green output color. So you can use different commands when running different batch files.